Just like usual clipboard functions on your Mac. Note: Cut and Paste only appear where the text is editable. Tip: Hold shift (⇧) when you click Cut, Copy or Paste to strip the formatting from the text in the process. Perform web search for the selected text, in a new browser tab. See also: Change the Search Engine. Open the selected web address(es), in a new browser tab. Tip: If you select several links, PopClip will open all of them. Bonus tip: If you hold shift (⇧) when you click Open Link, PopClip will copy the links to the clipboard as a list. Compose a new email to the selected address(es). Reveal the selected file path in Finder. Look up the selected word in the built-in Dictionary app. Note: The Dictionary action only appears if the word you selected is actually in the dictionary. See also: Adding Dictionaries to OS X. If PopClip thinks the word is misspelled, it will offer suggestions. Click the correct word to correct the spelling. Note: Spelling suggestions only appear where the text is editable. Another note: You may need to set the Spelling Language in PopClip preferences, to match the language you are writing in. Make sure to check out the PopClip Extensions page, where you can choose from over 100 more actions to add to PopClip. You can also make your own extensions. Paste appears when you click editable text immediately after performing Copy or Cut using PopClip. To make Paste appear at other times (without selecting text), either hold down the mouse button for about half a second, or click twice in the same place. How long does PopClip stay on screen? Tip: You can also add a dedicated Paste and Match Style button using the Paste and Match Style extension. 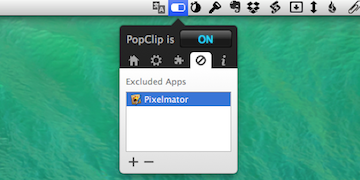 There are several ways to tame PopClip, if you find that it appears when you don't want it to. Hold down the ⌘ or Fn key while selecting text, and PopClip will not appear. To avoid PopClip showing up when using a particular application, add it to the Excluded Apps list in PopClip preferences. Click the '+' button to show the file chooser, and select the application you want to add to the list. Tip: Holding ⌥ when clicking '+'adds the currently active application directly to the list. You can turn off PopClip completely by clicking the on/off button in the preferences panel. Tip: Right-clicking the PopClip menu bar icon is a shortcut to toggle PopClip on/off. Advanced tip: You can also toggle PopClip on/off using AppleScript. Now that you have mastered the basics, see the Advanced Topics section to get more out of PopClip.